In this survey of asset manager perspectives on research valuation and other research unbundling topics, fixed income-oriented asset managers showed different behaviors than equity managers. The survey of global asset managers, primarily in Europe and the US, was conducted in September and October 2017. Over one hundred asset management firms (104) participated in an anonymous online survey of which European respondents represented 40%. U.S.-based respondents represented half of respondents. 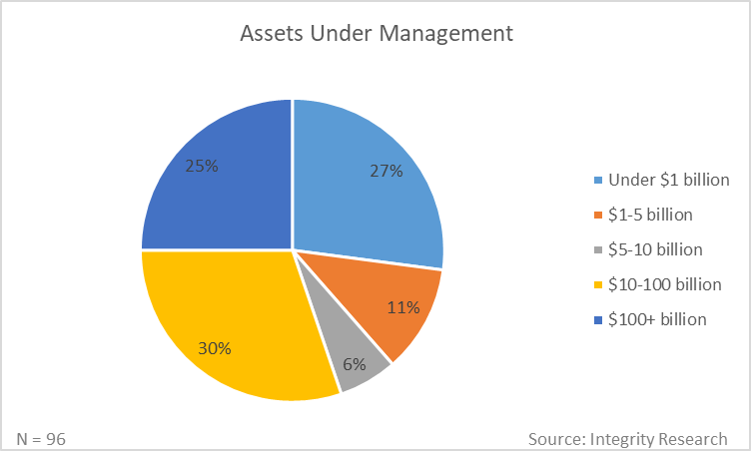 55% of respondents had assets under management exceeding $10 billion and one quarter managed assets over $100 billion. Nearly half (49%) of the respondents expected no change in projected research spending for 2018. However, of those expecting changes, fixed income managers tended to anticipate increased spending whereas equity managers expected decreased spending. Similar differences emerged in the expectations for allocating research payments. Fixed income managers were planning to allocate more wallet share to large investment banks at the expense of independent research providers. In contrast, equity managers were more inclined to shift spending from bulge banks to independents and boutique managers. Managers not subject to MiFID II expected little change in allocations. 60% of the firms participating in the survey were subject to MiFID II, at least in part. Of the remaining firms, over half planned to become ‘MiFID II Ready’. The majority of firms partly subject expected to ‘ring fence’ their MiFID II unbundling obligations. A majority of respondents expected to fund FICC research payments through their P&L but the view on equity research funding was more mixed. Corporate access and written research were among the most valuable research services and the most valued type of written research was initiation reports. The majority of respondents planned to use interactions data as part of their valuation process. Summary: Analysis of results from survey of global asset managers on research spending, research valuation and MiFID II preparation.